By the time I settled back to enjoy the quick and efficient Eurotunnel crossing I was looking forward to driving across northern France and the prospect of what the Champagne region has to offer the wine, food and culture-loving visitor. This was to be a luxury weekend in the Champagne region. The Champagne region extends from just north of the historical city of Reims (the locals pronounce it ‘Ranzs’) south through Epernay, another sizeable city and epicentre of the wine industry. Dotted amidst rolling vineyard scenery are dozens of pretty villages that give their names to Champagne’s best grand cru vineyards: Aÿ; Verzenay; Cramant and the rest. Do not miss the village of Hautvillers close to Epernay, impossibly romantic with its tumbling streets, flower-filled window boxes and wrought-iron signs, it also boasts a 7th century abbey where Dom Pérignon is buried. All along the well-signposted Champagne route are small houses that welcome passing tourists to stop, taste and (hopefully) buy, whilst in both Reims and Epernay the famous Grands Marques with their great châteaux and imposing gates are well-disposed to visitors. 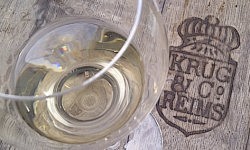 Not only can you taste, but you can descend to the extraordinary cellars carved from the chalk deep beneath the streets. It’s a fascinating thought as you stroll the pavements of Epernay that directly beneath you is a warren of over 100km of tunnels where millions of bottles of Champagne slowly mature, gaining weight and complexity during the minimum of 18 months they will spend sur lie. Each individual bottle has been dosed with sugar and yeast, then sealed with a beer-bottle cap whilst the magic of ‘secondary fermentation’ adds richness, flavour and of course, bubbles, to the wine. Historically Champagne has been a region composed of small farmers and large producers who led symbiotic but independent lives: the former grew grapes, the latter bought them to produce wine. But in recent years the ‘grower Champagne’ movement has developed rapidly, with many vineyard owners now producing their own wine. Whilst a couple of dozen ‘Grands Marques’ like Veuve-Clicquot, Mumm and Krug are the globally-known face of Champagne, there are now reckoned to be 15,000 producers. Many are tiny, family-owned garagistes. To get a true flavour of Champagne try to take in a least one visit to a large concern plus one to a smaller house or grower. Moët et Chandon has a palatial and beautiful property in Epernay that offers a whole series of guided tours through the cellars, each priced according to the number and quality of wines you will taste at the end. Most of the big names have similar set-ups. 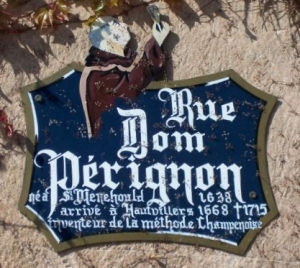 Smaller Grande Marque houses like Krug in Reims, Salon in Les Mesnil-sur-Oger or Pol Roger in Epernay are not generally open to the public, though a letter of introduction sent in advance may facilitate a tour or tasting. Many of the growers that line the wine route offer an open house to visitors, though again their small size means some of the top names require a pre-booked appointment. Growers like Henri Giraud in Aÿ (left) have some fabulous vineyards and sell their expensive and intriguing cuvées directly, including some vinified in oak from the nearby Argonne forest. Also in Aÿ, Champagne René Geoffroy has carved a huge reputation for beautifully refined wines including the ultra dry Brut Zero Cuvée Pureté. Reims is a fine destination for a city break in its own right. The streets of Reims have a strong link to motoring history. For 14 seasons until 1966, the Reims-Gueux circuit, a road race track just like Le Mans, was home to the French Grand Prix. Stirling Moss and Graham Hill were amongst the Reims-Gueux winners, and though the site of a winning driver spraying Champagne to celebrate victory might seem wasteful, the tradition started here. What better way to celebrate than with a ‘Champagne shower’? Large parts of the centre have been pedestrianised and a brand new tram system will whisk you around town if required. The city is big enough to offer plentiful shopping and entertainment options (a quick plug for chocolatier La Petite Friande at 15 Cours Langlet, producer of the most delectable macaroons). But without questions Reims greatest glory is its Cathedral. The current building dates from the 13th century, but a church has stood here since c.400 AD. Once the coronation place for French kings, the cathedral is adorned with suitably ostentatious artworks, from its extraordinary collection of sculpted figures to its breathtaking stained glass. 2011 marks the 800th anniversary of the current building and a new (and dare I say it, rather inappropriate) set of stained glass windows joins the Gothic examples. 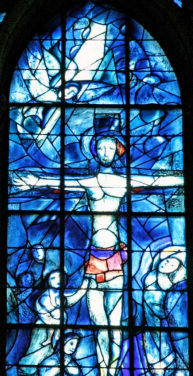 But it is the mesmerising window by Russian-born 20th century artist Marc Chagall (right) that for me take pride of place: a fantastical vision that bathes the alter in light. Other fizzes offer their own delights, but only Champagne fuses the seemingly contradictory notions of party time decadence and elegant sophistication in one delicious package. Despite the vagaries of the northern French weather, this was a magical few days in a region of pretty villages, historic towns and superb dining and accommodation options. As I started my journey home, I realised the joie-de-vivre of Champagne can sweep you up whatever the weather. Gastronauts looking for a few days of luxury will find sublime food and accommodation options in the region. Two of the best are also a fascinating microcosm of Champagne itself: one deeply traditional and offering the ultimate in cosseting refinement, the other minimalist and cutting edge, a celebration of chic modernity. Les Crayêres is a gorgeous, 1904 grand house in Reims that sits in seven acres of elegant parkland. 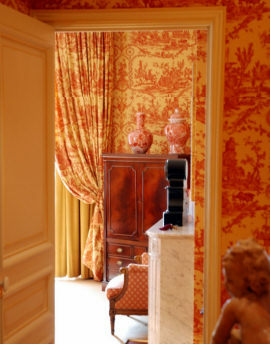 Its 20 rooms whisper luxury, from the marble and gold bathrooms, to the softly padded toile fabric walls, to the antique objects d’art. Rooms each have a different style, but luxury is the key word as befits a 5* Relais & Château property. In charge of Le Parc restaurant is young chef Philippe Mille, in post for only a year having arrived from Le Meurice in Paris. This was the gastronomic highlight of my trip. The elegant dining room is formal but relaxed, and dish after dish of impeccable, modern food built on classical cuisine was accompanied by wines chosen expertly by Sommelier Philippe Jamesse to provide one of my most memorable meals. Ultimate classical luxury. High glamour at lofty prices. Best rooms face the park, and a casual dining option is also offered in ‘Le Jardin’. Fabulous breakfast. Doubles from €345 per night. 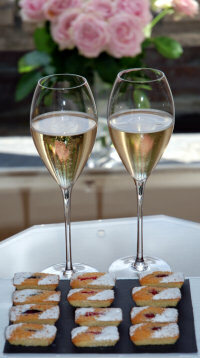 The contrast offered by the nearby L’Assiette Champenoise is exquisite. Chef/proprietor Arnaud Lallement was forced to take over the business at the tender age of 24 on the death of his father. He quickly earned a Michelin star, then a second in 2005. The cuisine is refined, delicious and surprises with some very original touches. New bedroom suites opened in January of this year, each with luxurious spa-style bathrooms, elegantly minimalist décor in muted tones and designer furnishings. Above: junior suite. The property is undergoing a plan of refurbishment and for the moment older rooms are much cheaper, but far less glamorous. Chic, cool and contemporary, though the renovated suites (from €380) are a class apart from the older rooms. Don’t miss the 2* restaurant either. Doubles from €165 per night. A different proposition is this grand chambre d’hôtes near Epernay. The 18th century rooms are comfortably shabby chic and bathrooms are modern. Doubles from €150 per night. Wonderfully spacious and refined, and the exquisite cuisine of Philippe Mille is surely worthy of a second star from Michelin soon. Truly brilliant flavours and technique, married to one of the best Champagne lists in the world. Chic and with a lovely outdoor terrace in the garden, losts of refinement here and lots of invention: a beef carpaccio was topped with a succulent lobster tail, crumbled Pistachios adding crunch, a tarte fin of tomato so delicate. In place only since March, young chef Michaël Nizzero has come from the Waterside Inn and is working wonders in the kitchen. Italian nuances to contemporary French cuisine. Between Reims and Epernay, the food and wine list in this deluxe restaurant with rooms is good, though the main attraction is the vineyard setting with its summer terrace. If touring the wine villages this is a lovely stop. The relaxed atmosphere caters for both business and family diners. Prices are moderate, starting at just €18.50 for a tasty lunch. Visiting the Champagne houses and picking up a few cases is on the itinerary for most visitors, but a day strolling through Reims and taking in its museums and the Cathedral is a must. Lunch guests at the fine Hostellerie la Briqueterie restaurant are welcome to stay on and use the hotel’s spa – with pool, saunas and hammam – free of charge. A version of this article first appeared in Square Meal magazine.